Pollution by heavy metals and potentially toxic elements is one of the main problems in tunneling construction in geothermal and volcanic areas. Kerman tunnel, located in the central parts of Iran (average base level of 2370 m and length of ~ 38 km), plays a key role in water transportation from Safa dam to Kerman city. The tunnel is located at the Kerman Cenozoic volcanic belt as a southern part of Urmia–dokhtar volcanic belt. The overburden of basement rocks above the tunnel axis is up to 850 m thick and the tunnel cuts across granite, diorite, andesite, trachyandesite and flysch rocks. 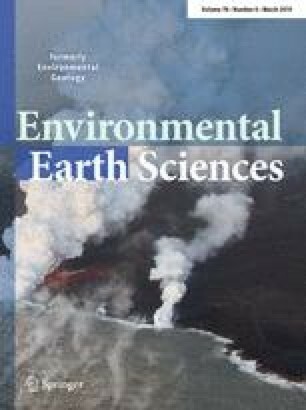 Based on the geothermal fluids’ evidences in the area, this study made an attempt to determine the hydrochemical characteristics and the origin of the elements in groundwater. This can identify the geological hazards in the tunnel route. To this end, 31 groundwater samples were collected from 12 boreholes and were then chemically analyzed. The results showed that the cations and anions had widely varying concentrations. High to ultra-high concentrations of As, B, Fe, Al, HCO3 and SO4 were significant properties of the water samples. The results of different diagrams, ion ratios and multivariate statistical analysis, especially principal component analysis (PCA) and hierarchical cluster analysis (HCA), confirmed that the unique water compositions and characteristics resulted from rock–water interaction and mixing of geothermal and meteoric water.